McAleer & Rushe, the contractor building a new office development on Station Street in Brighton, has partnered with Art4Space, a leading community arts organisation to explore ‘What makes young people proud to live in Brighton?’. 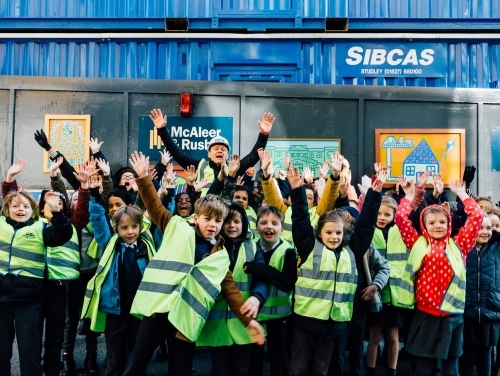 As part of the project, pupils from St Bartholomew’s and St Paul’s Primary School today unveiled their inspired artwork which has transformed the hoarding around The Brinell Building site. The unveiling was also attended by SHW (joint agents for the Brinell Building with Knight Frank) and Brighton and Hove City Council. The community arts engagement project is enabling Brighton’s children to develop a better understanding of their citizenship and local community through art and creativity. The primary school pupils have worked with Art4Space to develop the content of the artwork in the form of drawings, doodles, words and quotes, which will be displayed as an outside public gallery during the construction of The Brinell Building. The Brinell Building will comprise seven storeys of Grade A office accommodation and views across Brighton and to the seafront from multiple roof terraces. The development is targeting a BREEAM ‘Excellent’ rating and includes amenities such as secure underground car and bicycle parking, electric car charging points, private changing booths and showers, a drying room and a double height reception.